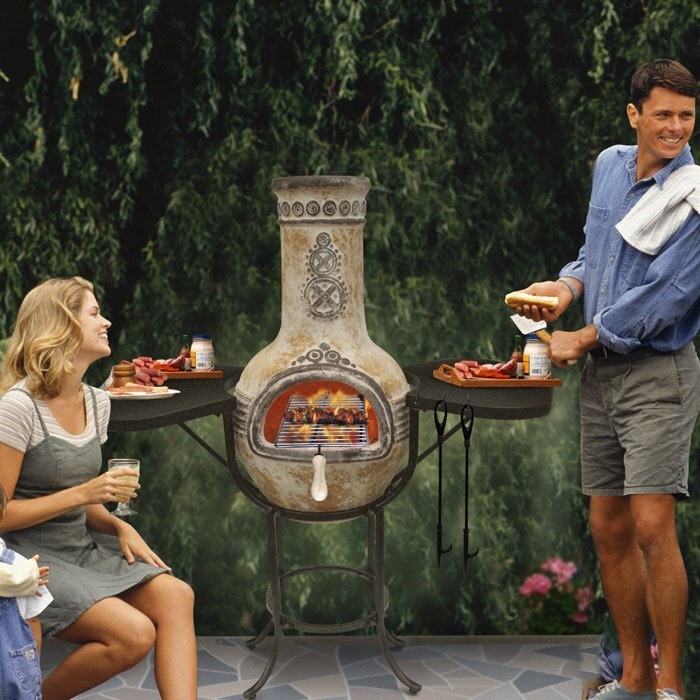 We have our summer rituals. Newspapers carrying pictures of girls at Glastonbury in muddy wellies. The declaration of undying love by a ludicrously remunerated footballer for his current employer and supporters, followed by his transfer to a club willing to pay him even more – “always been my dream to join the team I supported as a boy”/ “realising my life long ambition to play in front of the world’s most passionate and knowledgeable fans”. Boris Johnson making it clear that he has no desire whatsoever to become Prime Minister. 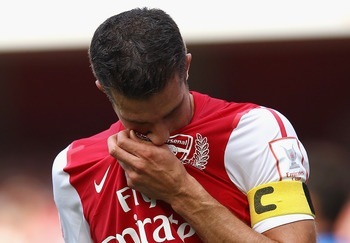 One international footballer “kisses the badge”, just before departing for a better paid post elsewhere. Mrs. Blog and I enjoying a summer evening on the patio. In my dreams. No, this is about proper plays. Or, as proper as you can get when the dialogue has to pause for each overflying aircraft, as I recall from one that my parents took me to many years ago on Richmond Hill, under the flight path to Heathrow. Perhaps it was Boeing Boeing, I can’t be sure. Despite the uncertainties of the summer weather, taking in a homespun but highly professional production (which is what they usually seem to be) in a gorgeous setting has been very much part of my summer since I don’t know when. It’s been nearly 50 years since I first saw Mikron Theatre Company perform in the beer garden of a canalside pub in the Midlands and I’m delighted to see that they’re still going strong, with their blend of social, environmental and historical stories, told through words and music by a small, enthusiastic cast of relatively unknown actors. Now it seems that, all over the country, in the grounds of stately homes and hotels, on village greens and anywhere that might make an attractive backdrop, on any given summer evening there will be dozens of performances taking place, from Shakespeare to self-written – preferably nothing too heavy, and nothing that might be spoiled if it has to compete with a downpour or two, lowing cattle or the odd low flying bat. Why do so many of us take the risk of getting soaked, of dodgy acoustics, of long interval queues for the only toilet in the village hall, of a vertiginous drop in temperature during the second half, after arriving in shorts and sandals on a hot afternoon? Because indoors you can’t see the trees and the stars, that’s why. 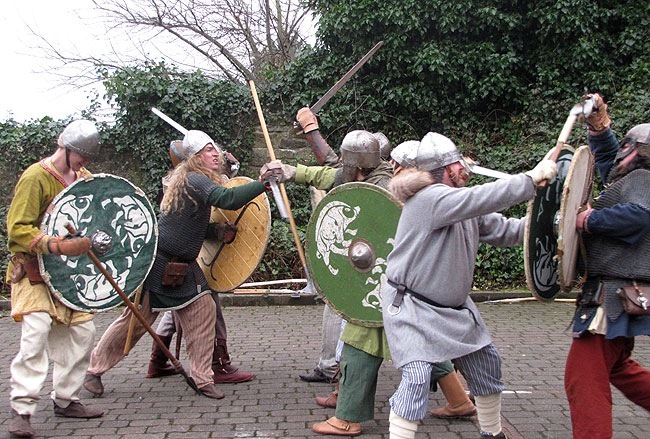 Because open air theatre can put you close to the performers, at the very heart of the action. Because, before the light goes completely, you can check out what everybody else has brought as their picnic – and wondered why your slice of gala pie, cheese and onion crisps and bottle of ale looks a tad miserly compared with the spread that Pauline always puts together. Because it’s what we do. It may be that we do more of this in the south, I don’t know. 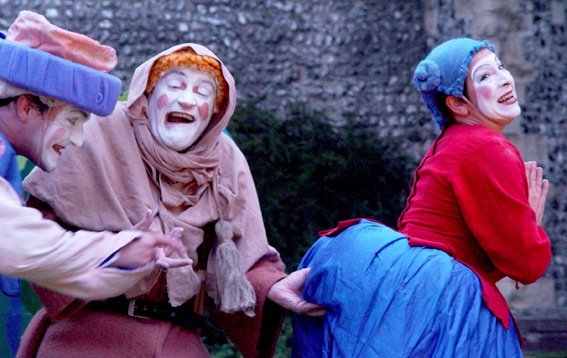 Moving to Lewes in East Sussex with a daughter of primary school age, the plays that took place in the Gun Garden of the castle soon became a fixture for us. With the promise of a picnic, the possibility of being able to whisper without upsetting those around, and the ability to move about if necessary, this just had to be a great way of introducing a young child to live theatre – as well as having a good time. And so it has proved. The daughter, now in her twenties, has developed a love of theatre much more sophisticated than ours and no longer has to be tempted to a play by the prospect of chicken drumsticks and cheesy straws – though it helps. And we can still be guaranteed to take in at least one outdoor production with chums during the course of the summer. Any regular readers of this blog may be aware that I have been known to have “constructive dialogue” with those who insist on talking, or singing along, during outdoor classical concerts but, in truth, I have not found this to be an issue with plays. To date, performances of Romeo and Juliet or The Importance of Being Earnest have proved mercifully free of audience members chanting along with the punch lines. Altogether now, one two three, A Handbag?? A Handbag??? I did wince last weekend as the play began and a number of iPads were immediately raised to record the proceedings, but I’ll live with it. There was a time when you went to an art gallery to look at the paintings, not to take your own self-portrait in front of it. And a time when a play was to be experienced and enjoyed “in the present”, rather than being inflicted afterwards on friends (real or facebook) who, frankly, couldn’t care a…. I’m not saying that all of our open-air play experiences have been plain sailing. If arriving early, for example, at the play venue and having been asked by friends to “save us some space near the front for our picnic”, I have never found it comes easy, defending acres of green sward on my own, armed only with an assortment pack of crisps to spread thinly around as the crowd presses in on all sides. I think this reluctance goes way back – to when my mother used to drag me to the old fashioned Sainsbury’s where you got put in the queue for the loose packed butter to “save a place” while she went for the sugar. By the time I reached the front of the queue, still searching anxiously for a returning parent, I was spent. 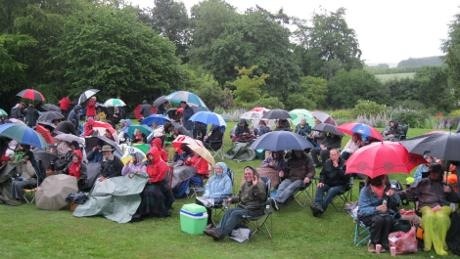 For one memorable production of The Tempest at Lewes castle (you’ve guessed it) we turned up with the rain already torrential and were supplied on arrival with binliners to wear as ponchos. That wouldn’t have cost them much – only a few perverse idiots had made it to the starting line, this blog and blogdaughter amongst them. (We will draw a veil over Mrs. Blog’s response to being asked if she intended to come with us and just say she didn’t make it.) The dialogue was tricky to pick up in competition with the rainfall and intermittent thunder and the action wasn’t easy to track between the umbrellas, but the effect of all that water on some of the skimpier costumes provided a diversion. At the interval, with audience numbers having continued to dwindle throughout, the company manager announced that anybody who wanted to throw in the towel, as it were, would be welcome to exchange their tickets (or papier mache, as they might by now reasonably be described) for another performance, but that the troupe was prepared to soldier on if wanted. 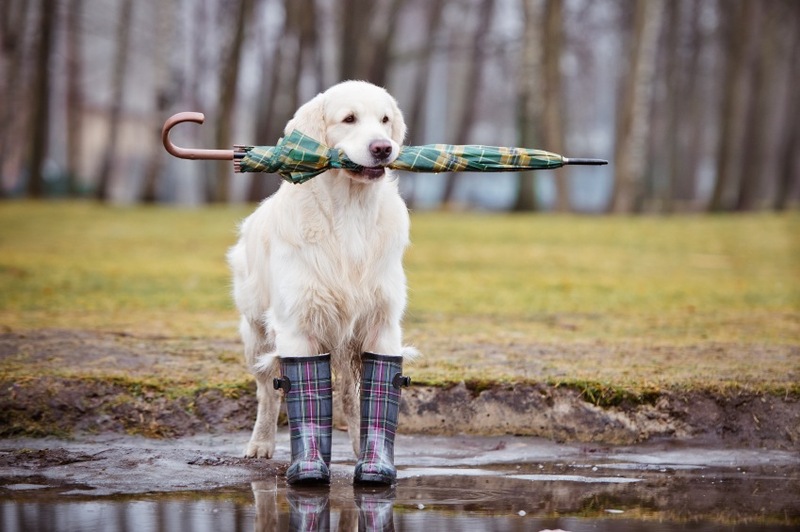 Well, call me dogged if you will (I suspect the actors may have had another word) but, as true patrons of the arts, and being by now far too wet to care, we held our ground and the six of them continued to perform to an identical number of us. Churchillian? I think so. We are fortunate to have seen a few different touring troupes in Sussex but one we never miss, year on year, is the Rude Mechanicals (the “Rudes”), whose final performance of their summer tour we thoroughly enjoyed last weekend. Named for the manual labourers and amateur actors in Midsummer Night’s Dream, and touring the south of England since 1999, the Rudes bring their own version of commedia dell’arte, a style that uses large comic and often acrobatic movement and physical humour, with white faces, bright costumes and liberal use of the “slap stick”. Hard to describe but huge fun to watch. And bawdy. If you’re easily offended, make sure you see them! Like many other arts groups, the Rudes struggle to make ends meet. Not because they’re expensive to run – they’re not — but just because that’s the way it is, with public and private funding harder and harder to come by. You may take the line that, if the customers won’t pay enough for the product, it’s tough – market forces and all that. Somebody will no doubt tell me that most other forms of entertainment have to pay their own way. Funding for the arts isn’t really my field (come to think of it, I’m not sure what is), but I, for one, would find my world a sadder place if there were no Rude Mechanicals, no Mikron. Go see! We hardy Scots ( Mrs Blog also being of that ilk) do like our ‘ootdoor’ events, but they tend to be more of the caber tossing variety – Mrs Blog’s auld friend favours the more salubrious charms of the ‘a pie and a pint’ plays in the comfort of the Oran Mor in Glasgow’s West End, I have also been known to sample the charms of the DPT (Dumbarton People’s Theatre) and am a regular devotee of Glasgow’s Kings Theatre annual pantomime (Oh no you’re not – oh yes I am! ), but outdoor plays? Not for Kilty Caulldbum, although having said that, this is the woman who took to her garden in her night clothes at the Summer Solstice, candles in both hands, and blessed all my plants, filmed mercilessly by husband….would you like to see this video? No, I thought not……We did have outdoor music in Balloch Park once or twice, and the plan was to have classical concerts, but oddly enough, have heard no more about it. Maybe now that they are finally spending money shoring up the much dilapidated Balloch Castle it would make a nice backdrop to some Mozart serenades , but then again they would have to play very loudly to drown out the noise of the jet skis on the loch….so much for tranquility in the National Park. So lang may the lums of your Rude Mechanicals reek, they sound as though they are doing a splendid job ,and you are certainly doing a sterling job raising awareness of yet another of our wonderful, colourful and historical British traditions! Well done Steve! Nice blog – again. Much with which to identify, and agree. The Rudes are certainly worth the effort and the discomfort – and that diminishes rapidly with a jug of Pimms or a glass or two of cava, something you can’t do during the performance in most theatres!